Accordingly, the two countries signed agreements for cooperation on rail networks, the development of Mongolia’s mineral resources, and currency swaps. The two countries also set the ambitious goal of boosting bilateral trade to a total value of $10 billion by 2020. Trade in 2013 was worth $6 billion, representing nearly a 20-fold increase over 2002 levels. In addition, China has also agreed to let its land-locked neighbor access China’s northern ports for use in Mongolia’s trade with other countries. Mongolia will also be able to use Chinese rail networks for transporting goods to other markets — welcome news for Mongolia, which currently relies on China for roughly half its total trade. For its part, China is eager to have Mongolia join in building the “Silk Road Economic Belt,” envisioned as an integrated economic zone stretching from East Asia to the Middle East or even Europe. Mongolia would be able to join both the overland and maritime branches of the new “Silk Road” only by going through China. In addition to economic partnerships, Xi Jinping also indicated that he seeks increased political and security ties with Mongolia. 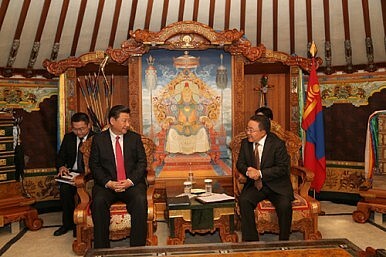 During the visit, Xi and Mongolian president Tsakhiagiin Elbegdorj upgraded their countries’ relationship from a “strategic partnership” to a “comprehensive strategic partnership” and pledged to increase the number of bilateral visits as well as coordination on regional affairs. This fits well with Mongolia’s ambition to play a larger role in regional diplomacy. Most importantly from the perspective of Ulan Bator, China repeated its promise to help Mongolia join APEC, which happens to be holding its annual summit in Shanghai this November. As expected, Xi Jinping issued an invitation for Elbegdorj to come to China for the APEC summit this November, where he will join Xi and others in an informal dialogue on the sidelines of the main meeting. Indian Prime Minister Narendra Modi also received such an invitation. Being present on the sidelines of the meeting will help boost both India and Mongolia’s bids for APEC membership. The invitation to be in Shanghai for the APEC summit further extended the atmosphere of good-will and friendship that was on full display during Xi’s visit. Chinese media drummed up Xi’s trip as an important example of China’s “neighborhood diplomacy” policy, which was defined by Xinhua as “treat neighbors as friends, make them feel safe, help them.” As my colleague Clint noted, China has had some difficulty translating this vision into reality, as several of its neighbors are increasingly concerned about Chinese aggression. It’s not likely that Xi’s stay in Mongolia will assuage fears in Hanoi, Manila, and especially Tokyo, but it can provide an important example of the benefits of friendship with Beijing for countries that are still more or less on the fence. At this point, that might be all that Beijing is aiming for — enough regional goodwill to be able to stand firm on its disputes with a minority of neighbors.